When it comes to controversial cleaning topics, cleaning hardwood floors with vinegar is close to the top believe it or not. If you are in the ‘it’s not safe camp’, you probably won’t like this post. But in my research and years of personal cleaning experience, I believe that there are 3 basic and safe methods that can be used. What’s the big concern with vinegar and hardwood floors? 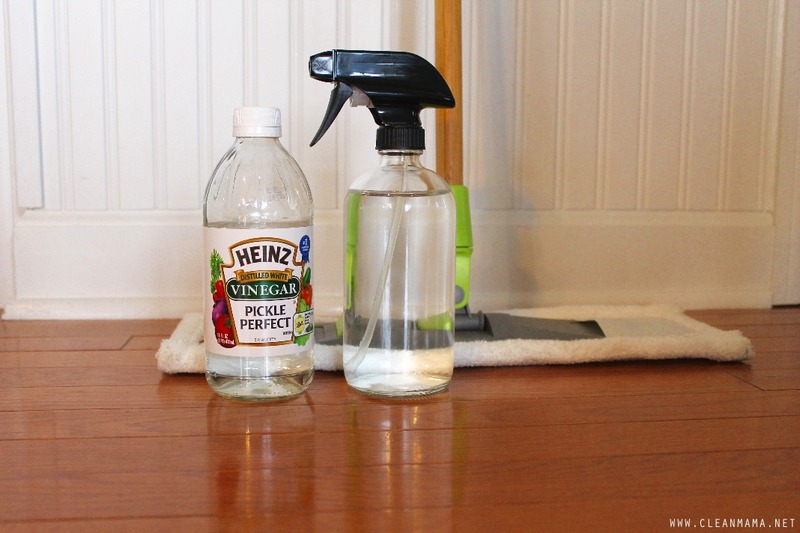 Vinegar is an acid and hardwood floors need a pH neutral or close to it cleaner. When mixed with water, the solution’s acidity is drastically lowered and it becomes an effective method to wash hardwood floors. 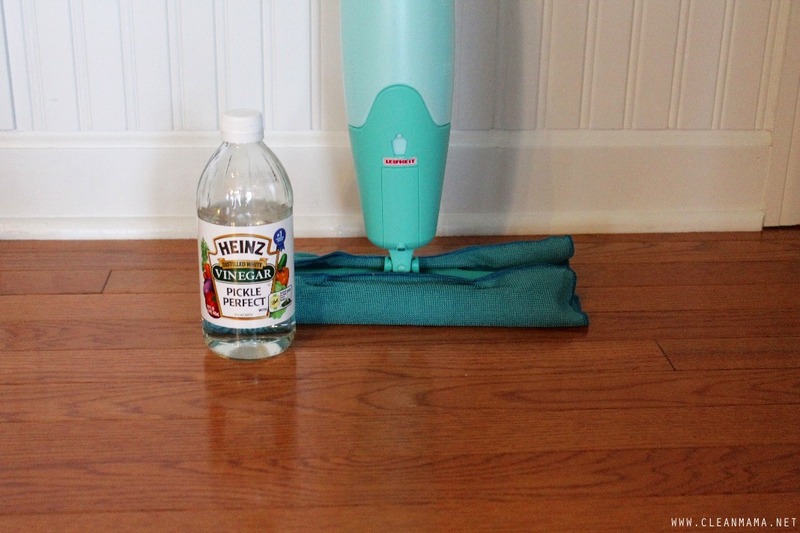 The vinegar and water mixture cuts through dirt and grime, leaving a streak-free and naturally clean floor. NOTE: Cleaning floors with vinegar is merely my suggestion, please form your own opinion and try at your own risk. If you are unsure, test in an inconspicuous spot. These recipes are only for SEALED hardwood floors or pre-fabricated hardwood floors, not waxed or unfinished hardwoods. I always I like to give my readers a range of options and solutions. Some people love making their own cleaners while others prefer the pre-mixed, ready to go options. I only recommend products that are non-toxic and safe to use around people and pets, but these are all products that I use and love. At the end of the post you’ll see some a post linked with other hardwood floor cleaning options if you don’t want to use vinegar. Hardwood floors foot sections and never let standing water sit on hardwood floors as it can warp and ruin the wood. This is the old-fashioned method to wash floors and works great if you are wanting to get up close and personal with your floors. 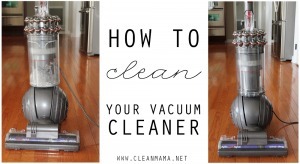 I don’t do this every week, but when I feel like the floors need a really good cleaning, this works really well. You can use the mixture on most baseboards too. Refillable spray mops (this is the one I’m using now – I love it!) 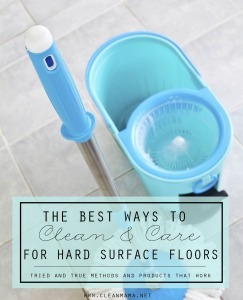 are super convenient and work well for daily touch ups and regular floor cleaning. Make sure that your microfiber pad is rinsed frequently to prevent streaking. If you prefer a spray bottle and microfiber mop, this works great – I recommend this microfiber mop. 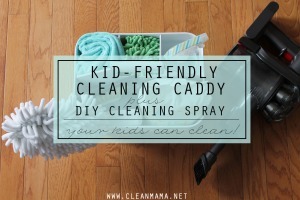 Mix up the same solution that you’d put in a refillable spray mop bottle, wet the mop head with water and wring out. Then spray and wipe, working in 4-6 foot sections. 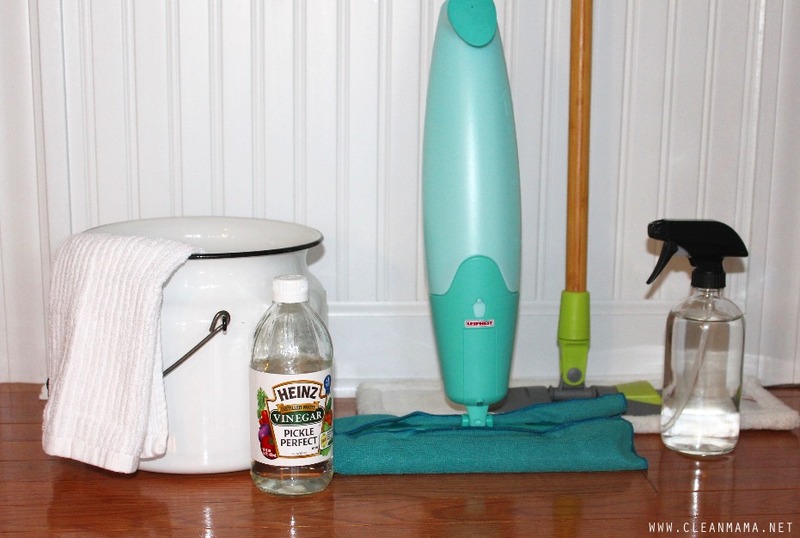 What’s your favorite hardwood floor cleaner and/or method? We always recommend for our eco-friendly clients to use vinegar for cleaning just about anything between our services. A lot of times they’re concerned about the smell, but that will go away once its dried and aired out. When we moved into our home two years ago, I discovered that the previous homeowner had cleaned all of the hardwood floors with a Swiffer mop. For years. When I used my microfiber mop for the first time, it quite literally stuck to the floor. It would not move. The Swiffer had left a layer of sticky, streaky nastiness all over my perfectly good wood floors. In addition to that, the previous homeowner had a little white dog that shed copious amounts of fur. The Swiffer had essentially glued all of that fur to the floor. I used the third method you described, the vinegar solution in a spray bottle and my microfiber mop, to undo all the caked on Swiffer solution and dog hair. It took about a week of daily treatments and elbow grease, but my persistence paid off. Yay for clean and skate-able floors! I am used to the first method. The easiest and the most convenient one. Thanks for the tips! I want to comment on the safety aspect. Almost all hardwood floors used to be coated with solvent-based polyurethane. That kind of coating was somewhat impervious to acids and bases like vinegar and ammonia (another traditional floor cleaning chemical). Now, we have a diversity of finishes on hardwood floors. Some are factory finished baked-on coatings that are extremely durable. 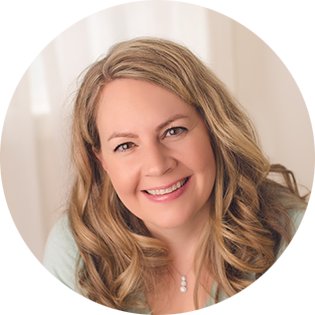 My floors were recently coated with polyurethane in my home – but newer formulations are water-based and I expect them to be more vulnerable to acids and bases. I heard once that vinegar dulls the sheen on hardwood. Do you know if there’s any truth to that? I haven’t found that to be the case as long as it’s mixed up with the proper ratio of water and vinegar. Do you have any recommendations on cleaning wood laminate? Would this work on laminate as well? I love a good flat microfiber mop with diluted vinegar. if you have minor scratches, follow the vinegar wash with a strong tea solution on a microfiber cloth. I use 4 tea bags to a quart of water. The 100 year old floors look wonderful. Awesome! I was just sitting here wondering because my word floors are older (20 years). I know that’s not very old but I don’t know anything about them. I’m going to try the vinegar and then tea! I will have to try that Mary! Noted. We don’t wear shoes in the house, so my floors look great. I always thought I took good care of them. Until one day My cleaning lady (when I had one *sigh*) told me to stop using vinegar on my floors and I was like HUH? so chemicals are better? LOL Thanks for showing me the way! 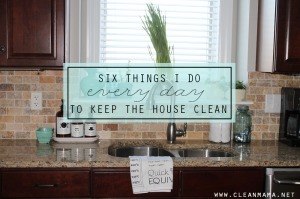 I do all my own cleaning now (I only used a cleaning lady for a couple of years when I had severe adrenal fatigue). Thank you so much for this much needed article! I’ve been struggling to find a good way to clean our floors. My question is this: I just purchased a regular mop, could I use that instead of the spray/flat mop you have in section 2? 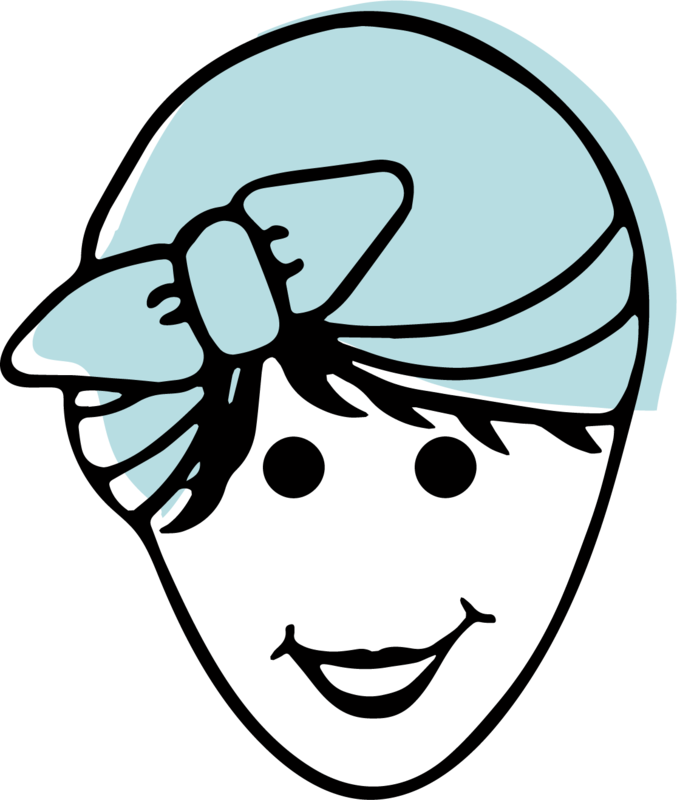 Hi Becky, I came to your sight because I misplaced my measurements for the vinegar water solution.Wish I could still do the floors on my hands and knees, but just can’t do it anymore. I had previously used Murphy’s oil for cleaning in another home, floor guy says it will clean, but dries to a dull film. my floor installer said not to use a regular “sponge” type mop because it holds to much water. Vinegar and water works great. Thanks for these great tips! 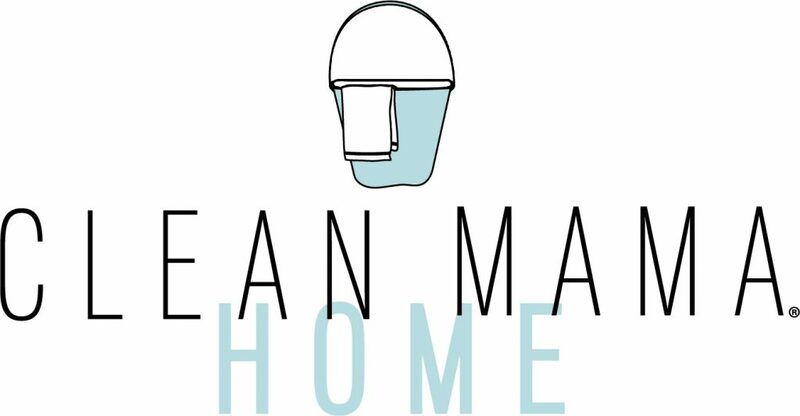 Do you find that adding essential oils to your refillable mop does any damage to the mop over time? Essential oils are so potent that they break down plastic over time, so I always wondered about adding them to my mops for that reason. I have engineered wood floors and currently use Bona. It leaves a dull residue behind. 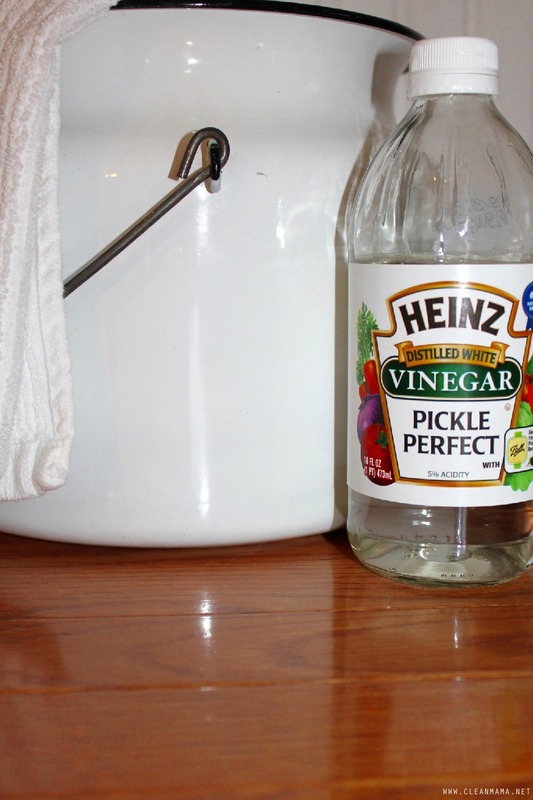 I would love to try your vinegar method. Any experience with engineered wood? Test in an inconspicuous spot, but it should be good! I have hardwood floors throughout my house, which my dogs have ruined, will vinegar take the urine odors out? My floors are in desperate need of deep cleaning. Also the floors are dull and discolored, you can see in the corners the color they used to be. Any suggestions would be appreciated. Tonya- Not sure about how to solve the discoloration issue, but we used a national carpet cleaning company who does hardwood floors too to get a deep clean in and they hit them with a top coat that helped shine them back up again. It helped us a lot and now they are more manageable to keep up with. Also, hardwoods tan from the sun. Good luck! I have found this solution of vinegar and water is the ONLY way to get rid of the drool spots my beloved dog leaves on my hardwood floors. They look fantastic. The people that resurface our wood floor said to use the vinegar/water method. I misplaced directions for vinegar/water ratio. So thanks. Using the vinegar water solution with a microfiber mop works great. We just moved apartments with hardwood floors that are sticky for some reason. I’m scared to use vinegar since it’s an apartment we’re renting. I’m guessing the floor was just varnished, and if it is will this still be safe? Thanks in advance! I would contact the Quick Shine company and see how they recommend removing it. It’s water soluble so it should wear off over time. I have brand new engineered hardwood in my home and have been so reassured by the comments regarding the vinegar and water method. I used a ratio of 1 cup vinegar to 6 cups of water and they look great. Great to know I am on the right track/. I don’t have to resort to one of the commercial products that have reviews indicating they will dull my beautiful floors. Just a note to be VERY careful when using essential oils for cleaning surfaces that may come into contact with your pets (cats especially). Cats lack an enzyme (glucuronyl tranferase) that other animals have to help process and break down certain components of essential oils. In the above recipes, lemon and clove are both mentioned, but both of these can be toxic to cats. In the dilution it should be fine but yes, definitely check with your vet. I’m not finding it online anymore – sorry! How should I clean if they are not finished? We moved in a year ago and most of the sheen on the floors is gone:( there are areas of visible wear. How should I cleanuntil we can have the floors refinished? You could try to ‘restore’ it with a Bona floor polish – it’s a thin, non-toxic poly that you apply and just stay off of for an hour or so. I’ve used that with great results! I over watered a plant and water stained my hardwood floor. It is in a bay window with heavy sunshine. Any tips on getting rid of water stains!